We're all about user-friendliness - We design and build websites that are easy to navigate, quick to load, and make finding information fast and easy. Simplicity and a long-lasting user experience is the name of the game. Take control of your website with Joomla (CMS), allowing you to keep your website content fresh and up-to-date. 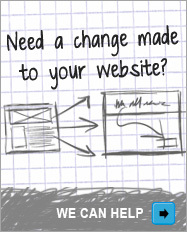 Don’t pay big bucks to have someone make small changes to your website. You can now do it yourself with this easy-to-use online solution. Give us a call or send us an email. Tell us what you need and we will provide a free, no obligation quote. Our service is fully guaranteed.